This is the clash of cultures right here! As we watched this noble traditional festival that had brought an entire community together, young Bhutanese boys wielded plastic guns made in the west, emulating Rambo-values in their ancient Kingdom. This was so discouraging to see. How can we do our part to protect and share with the world something that is so pure and innocent, before it is lost forever? 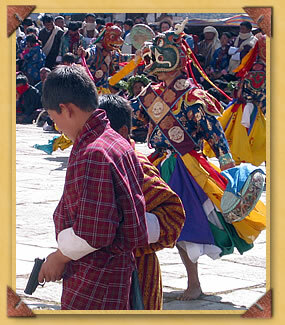 Children play with toy guns at a thousand year old festival in Bhutan. What's mud got to do with it? To the Bhutanese, the lotus flower symbolizes our most noble qualities of kindness, tolerance, and compassion. I asked why this was. I was told that the lotus is a precious flower that grows out of the mud. 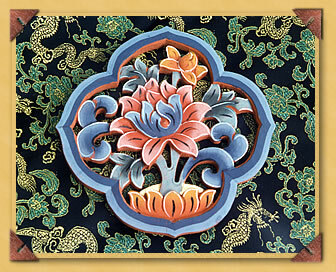 Like the symbol of the lotus, the Bhutanese remind us that we often grow spiritually through hardship. When we suffer we open to the suffering of others. This is compassion. When things don't go so well we discover patience and humility. One sees these lotus carvings all over Bhutan. They act as reminders to the Bhutanese of the hidden treasure that lies buried in difficult circumstances. It became evident to me that the master craftsmen and artists needed a place to pass on not only their skills, but these messages of enormous courage and wisdom that make up the Bhutanese culture. The Cultural Center of Bhutan will encourage and pass on these traditions.